For many years now, the world has been contending with the problem of global terrorism and dedicating huge resources in an effort to eradicate it. Various commentators and academicians built thriving careers based on in-depth analysis and pseudo-sophisticated economic and political explanations for the origins of this phenomenon. The truth is in fact much simpler, yet the world persists with its blindness and chooses to fall prey to baseless theories. One school of thought espouses the economic explanation: Terrorism is the weapon of the poor – just give them a home and a car and all will be well. One could expect that the September 11 attacks, mostly carried out by Muslims from well-to-do families, just like bombings across Europe carried out by local Muslims (rather than dispossessed Afghans, for example,) would undermine this theory, yet this did not happen. In fact, had most world leaders been genuinely interested in grasping the economic truth, all they would have to do is take a deeper look into none other than the Arab-Israeli conflict they so much like to meddle in. They would then discover, as noted by Dan Schueftan in his book Disengagement: Israel and the Palestinian Entity, that the various “Intifadas” and Arab uprisings against Israel tend to take place in periods of economic prosperity of all things, when the fruit of cooperation with the Jewish state are readily apparently. Yet this prosperity, just like the heavy economic price paid by the Palestinians in every round of fighting, did not prevent the Arab murderousness. Yet another school of thought points to the political aspect: Brutal repression and thirst for freedom push various terrorists to carry out “desperate acts” such as blowing themselves up in cafés crowded with teenagers or slitting the throats of foreign journalists. Yet based on this logic, the Jews (who have suffered murderous repression unprecedented in the history of humanity) should have turned into a nation wholly made up of bloodthirsty terrorists, while Tibetans, who been living under ongoing Chinese oppression, should have established a global terror hotbed. So why didn’t this happen? How could it be that instead of producing suicide bombers, Tibet happened to give rise to the amicable, peace-loving Dalai Lama? The simple and sad truth is that terrorism is an “acquired taste” and affinity for terror is a value that one must nurture and impart. Just as many families and states worldwide educate their children and people in line with the value of tolerance, for example, other people and nations prefer to encourage their sons and daughters to choose the path of murder and terror. 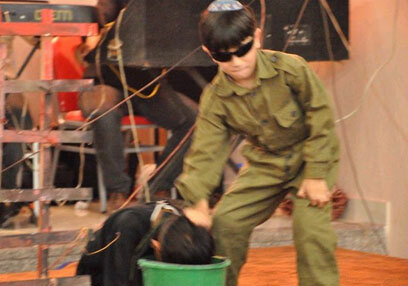 Indeed, after long years of such “education,” in kindergartens, schools, on television and in prayer houses, there is no wonder that many members of these peoples take the path of terror and turn this murderousness into a prevalent way of life. This connection between education and terrorism was demonstrates in the clearest and most shocking way possible in photos published Tuesday. 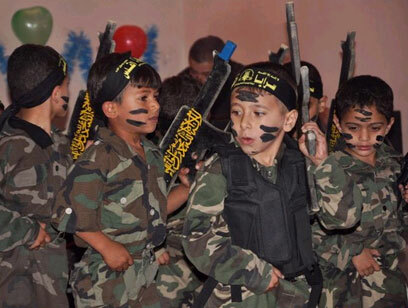 The images from a year-end party at a Gaza kindergarten show young children wearing army fatigues and waving toy guns. 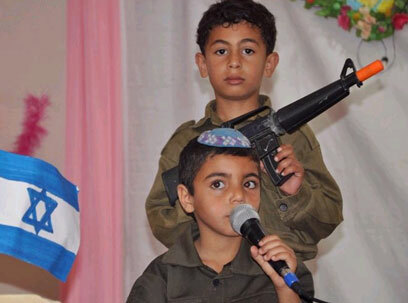 These same youngsters also chanted anti-Israel slogans, expressing their desire to attack the Jewish state with missiles, blow up in buses, and die as martyrs. This is the whole story, and one can only imagine what would happen had leaders of the world dedicated all their efforts and resources to fighting terror’s real roots. What would happen, for example, had instead of toying with contacts vis-à-vis Hamas and handing over “aid money” that ends up in the hands of terrorists, the world would have imposed grave sanctions on every organization and person involved in terror, incitement to terror, or terror education? What would happen had the inciters and “educators” been marked as targets for assassination, and NATO jets would have bombed any structure used for this kind of education, be it a mosque or a kindergarten (when none one is present, of course)? Could it be that an uncompromising war against the sources of terrorism, instead of attempts to engage in dialogue with terrorists and divert attention to dubious directions that have been proven ineffective, would wholly change the grim reality we currently face? Regrettably, as long as foolish policies persist, we shall not receive an answer. And so, year after year, decade after decade, innocents will continue to be slaughtered around the globe, with no end in sight. See all talkbacks "The truth about terrorism"